With its foundations almost two meters underground, the church dedicated to the Emperor Constantine and the Empress Helena in the Delcevo village of Razlovci, eastern Macedonia, nowadays is still proudly telling its story about the courageous rebels. Surrounded by a beautiful grassy yard, the church is emitting its uniqueness and triggers off the curiosity of guests to enter the church and feel the spirit of ktetors, to see with their eyes almost closed the shadows of the rebels and to hear their voice calling to fight for liberation against the Ottoman Empire. And, the heavy ancient wooden door is separating the interior of the church from its entire mystical world from the outside world. “Stoil Kovach, one of the ktetors of the church, had made two keys of this kind. But, one of them had been lost over the years, so I’m keeping this one because it is the only key that unlocks the door. I’m taking care of the key, the church and when guests are coming over, I’m more than pleased to welcome them and to open the door. 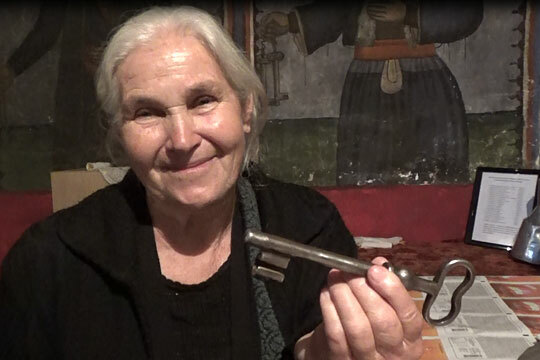 For us, this is a precious key, because it had been made by Stoil Kovach himself,” says grandma Elena with a beaming smile. Stone steps lead us down the stairs in the church. Although its western section is poorly lit, one can start to recognize the faces of the four ktetors of the church. 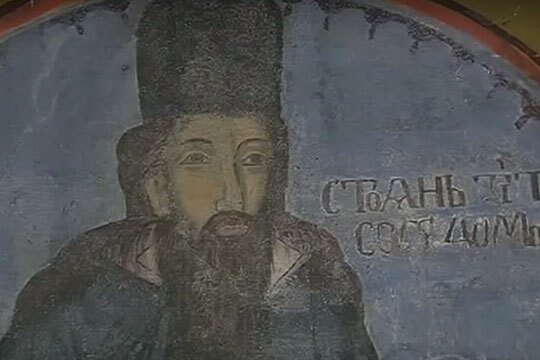 The first one painted on the wall is father Stojan, the leader of the Uprising of Razlovci, while Cone Spasev, Stojan Gjorgov and Stoil Kovac are right next to him. After the uprising was suppressed, father Stojan before leaving the village had covered his portrait with quicklime and ash. It remained in this condition for 100 years. It was unveiled in 1976 to mark the centenary of the Uprising of Razlovci. As there are no written documents about the construction of the church, folklorist Dimitar Uzunski has done a research for his monograph about Razlovci. He says he has used a myriad of folk tales that had been passed from generation to generation. In the mid-19th century, the village of Razlovci was without a church. Church rituals had to be performed in a far away, deserted church. Father Stojan, who was one of the richest men in the region, came to an idea to build a church in the village so that villagers no longer had to travel to a nearby church. His idea was immediately backed by Cone Spasev and his two sons-in-law, Stoil Gjorgov and Gjorgjija Terziski. They were later joined by Stoil Kovach. They formed a smaller group of well-off men who could fund the construction. However, the construction was obstructed by Ottoman authorities by banning building of a new church. To realize their idea, the ktetors conceived a cunning plan. The construction took place sometime in 1850. The whole village, men and women, was engaged in building the church. The iconostasis, which depicts scenes from the Old Testament, a scene of Adam and Eve in heaven and in hell, is quite rich. Protopriest Atanas Popovski, a descendant of father Stojan – the leader of Razlovci rebels – told us the secret behind the rich iconostatis in the local church. The icons were painted by Vasilie Zograf, who had left a small inscription on the icon of St. Mary, the Mother of God. Purposefully, St. Mary is portrayed as holding her right hand next to her body as if thought pointing to the inscription. The Macedonia sun was painted several times on the iconostasis, according to Popovski. One of the icons, he says, has an inscription that reads that it had been completed on 10 December 1859, which means the church had been built a couple of years before. The suns painted in the church a special and unique moment – a sun with eight and sixteen rays, similar to those of the ancient Macedonian dynasty of Argead. Also, the church keeps a unique, rate icon of the Macedonian saint Gjorgi Janinski. Some senior villagers says the church had been completed in early June. It was then when it had been decided that the church would be named after Emperor Constantine and Empress Helena. To this day, the village of Razlovci celebrates the occasion as an official day of the village. During the period leading to the Uprising of Razlovci, the church of Sts. Constantine and Helena would serve as a gathering place for all the rebels, who would make preparations for the uprising. It would serve as a hotspot that would begin to spread and ignite the desire for fight, for freedom and for a better and happier life. The church is considered a synonym of the spiritual and rebellious life in Razlovci and its region. The church is the place where in 1876, father Stojan and his son-in-law Dimitar Pop Gjeorgiev would lead 30 rebels from Razlovci into the first, authentic Macedonian armed uprising against the Ottoman rule. The month of May is unmistakably marked by the village to honor the anniversary of the Uprising of Razlovci. It was suppressed by late May by a heightened Ottoman army. Most of the rebels had been killed, others had been jailed. Father Stojan had managed to escape the Ottoman authorities by hiding in a monastery. Upon being busted, he had once again managed to escape, but this time he claimed his own life.